I’ve spent the last eight years trying to decode these issues and report about what companies are doing to not only embrace the essential message underlining CSR but also integrate a sense of responsibility within their culture. I interviewed practitioners, researched numerous CSR reports, and conducted multiple surveys on the issue to identify what exactly translates into a “CSR career” or “CSR job”. While feedback, comments and social media indicated that my reporting was helping raise awareness and compelling professionals to think about their choices, I realized that what we needed was a reference guide, an encyclopedia of sorts, a How-To of practical tips from executives who are embedded in large corporations and have experience influencing change, leading behavior change and staying patient when the profits vs. CSR debate rears its head. 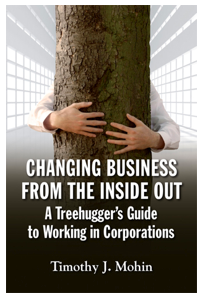 Turns out, Changing Business from the Inside Out: A Treehugger’s Guide to Working in Corporations is the handbook I was looking for. Written by Tim Mohin, Director of Corporate Responsibility at AMD, the book offers critical pieces of advice and practical tips for current and aspiring professionals who believe they can make a difference through their careers. And that is the segment that Mohin wants to target. He told me a couple of years ago that he wanted to write a book aimed at people who “want to change the world through business.” Then, jobs were few and we were struggling as an economy. Occupy Wall Street was yet to take shape. And corporations were focused on surviving a deep recession not worrying about their social responsibility quotient. But as we know today, this recession has not only furthered the divide between consumers, employees and corporations on a whole host of social, environmental and economic issues, but also pointed the finger to each and every one of us. Where does the blame lie? How did we get here? In this vacuum of trust in the marketplace, Mohin’s book is a much-needed antidote for professionals and students who want to restore our economy, while protecting the environment and benefitting society, but lack the practical advice. “Increasingly I felt that people who wanted to have a meaningful career didn’t understand what the field involves. There are certain sets of skills that need to be acquired,” he added. The CSR field is growing. And companies are starting to respond to what was primarily a movement driven by activists, students and academia, by creating CSR departments and integrating corporate citizenship into business strategy. He likened the evolution of CSR to the quality movement in the 1980s when every company responded by starting a quality department. “Today, large companies realize that they must have someone in charge of CSR. It’s not a new department per se but builds upon the community, public affairs or environmental teams and adds on other parts of corporate citizenship,” he said. Now, the question of having CSR departments has always triggered opposing reactions among professionals, executives and job seekers. Should CSR be a separate department? Or an integrated element of everyone’s job description? Or a C-suite led initiative? “For example, most companies need to have a CR council and together we work through top-level goals to meet our vision, execution and measurement. When you look at CSR, it’s too broad for any one manager to manage. By nature, it’s a cross cutting service group that works with others to get the job done,” he emphasized. Mohin’s advice hits home. For years, I have advised students and professionals that to forge a career in CSR, they must first develop a sector expertise, a specific skill set and then decide which element of CSR they can fit into. Using “I want to work in CSR” is never a good starting point. “In chapter one, I identify how CSR has evolved at companies and how organizational structure affects the practice. Use this to figure out where you fit. Then turn to chapter two, where I list out the skills necessary for a successful career in CSR,” he said. Once you’ve identified where you fit, chapter three and four offer a crash course in CSR strategy and how to respond to emerging issues. The rest of the book focuses on the many different programs under the umbrella of CSR. “So pick the one that applies to your skills and passion and then understand how to excel in that particular field,” he explained. For example, supply chain is an area that Mohin has devoted part of his career to while at Apple. But his emphasis – two long chapters – on the area of supply chain has more to it than passion or experience. “For me, this area is the No. 1 growth area in corporate responsibility. When you see the trend starting back a few years ago with Nike and Gap’s supply chain woes, and now Apple in the electronics industry, the critical importance of supplier responsibility becomes clear,” he said. “Now it’s becoming embedded in companies more so than ever before because of outsourcing. Companies have found outsourcing to be cheaper and strategically more efficient for them. But accompanying that, we need a supplier responsibility program, therefore the growing demand for professionals who can understand all the nuances of both supply chain and social responsibility,” he said. In order to drive a CSR program, however, whether it is supplier responsibility or environmental impact, every project requires a robust method set in place for the collection and analysis of relevant data that can feed strategy and project the achievability of goals. And that’s where Mohin places his bets for success. A common thread at every company he has worked for, including Intel, Advanced Micro Devices and Apple, is managing data-driven programs. The ability to set quantifiable goals and measure progress has been a crucial aspect of his career in corporate responsibility. “[Data] has been a hallmark of my career,” he said. So much so that Mohin has devoted an entire chapter on the need for establishing meaningful goals and knowing what to measure. In the book – chapter four – he uses the examples of Intel, Coca-Cola and Starbucks to exemplify his emphasis. In our conversation, he referred to lessons from his tenure at Intel. “When I was the environmental manager at Intel, the first thing I did was establish Key Performance Indicators (KPIs) so that we could start measuring our global environmental performance and forecasting the future. As soon as we figured it out, senior management wanted to know. And because we were focused on the data, we were quickly able to identify the process changes and reductions that decreased our emissions even while production was increasing,” he recalled. “[You] need to be able to understand what’s important for your business and your stakeholders and how you can quantify progress in these areas to be successful. These metrics together become a dashboard seen by senior management regularly so they track the success measures and identify areas to improve. Running your program this way ensures that you will get the engagement and buy-in needed for a successful corporate responsibility strategy,” he said. Originally written for and published on CSRwire’s Commentary section Talkback on August 16, 2012. Sustainability isn’t the most favorable of topics with recruiters. But ask them about the sustainability of their hires and you’ll instantly hear a litany of complaints and frustrations. Yesterday, Vault kicked off a series of seminars on this very important, if not the most popular, topic for the recruitment sector: The increasing role of CSR and sustainability in recruitment. Sponsored by Madrid’s IE Business School, these seminars have been planned exclusively for recruiters and HR managers and align well with the School’s overarching commitment to sustainability (they have a master’s program dedicated to environmental change), social entrepreneurship, and CSR. But what makes sense on college campuses doesn’t necessarily align with recruiters whose objective is much more linear: To hire the best talent based on a specific list of behavioral and technical skills, with the hope that they will stick around for at least a few years. Retention? That’s an HR function. Offer examples – and best practices – of how recruiters can best illustrate their company’s corporate citizenship before the candidate comes aboard. In all my years at Vault (I left in July to start Singh Solutions, a research and advisory firm offering CSR communications and social media strategy services – and continue to write for CSRwire and Forbes), I have always put a premium on the efficacy of a responsible and innovative culture in attracting candidates. But when you bring in terms like CSR, sustainability, inclusion, things begin to get murky. While no one can argue that a business’ corporate and social behavior is a POWERFUL tool in attracting talent, especially in the current recession, how do you convey as much in a job interview? This is where the real disconnect then emerges, indicated amply by a series of interviews I conducted last year with four MBA candidates committed to pursuing work that aligned with their sense of corporate social responsibility: Boston University MBA Candidate Ashley Jablow, Geet Singh, Whit Tice and Larry Furman. This lack of urgency became the underlying theme of session number one on Tuesday. Joined by PwC’s HR and Administrative Leader for Florida Kimberly Jones and Guillermo Montes, Managing Director for South US, Puerto Rico and the Caribbean region for IE Business School, I offered the audience an alternative view: A reality where recruiters are not only responsible for hiring the most skilled talent but also the best fit based on their values. “Retention after all is half the battle. Getting the candidate in is hard but retention becomes equally challenging if we don’t invest in aligning the candidate’s personality to the company’s core values,” said Jones. For PwC, this has meant organizing initiatives like Project Belize and Project New Orleans, where summer interns get to participate in community building exercises, and the team hopes, get a real close look at the firm’s culture. “The average age of a PwC employee is 26 years old. So demands and expectations are quite different from older generations,” she emphasized, adding that a brand that not only commits to CSR but also makes it a priority becomes an increasingly valuable ally in attracting candidates. In a globalized economy where work can be outsourced at a click of a button and entrepreneurship is emerging as a serious alternative for many graduates, organizations have it tough, even if they don’t recognize it just yet. While recruiters might erroneously believe that the market is to their advantage, the fight for top talent remains fierce. This is where your organization’s culture, values, and social and environmental commitments can emerge as key differentiators for a generation that is demanding fairness, ethical behavior and responsibility from business. While the debate was spirited and the conversation heated at times, it was clear that the panel had been well received. We ran over time with questions pouring in. Examples include the impact of globalization on recruitment, how companies are dealing with an increasingly age diverse candidate pool, and whether we should expect reformulation of job profiles and descriptions in coming years. Suffice it to say, we together – the panel and the audience – shared something powerful this Tuesday: We experienced a crowd-sourced change in mentality. We made a commitment. Together. To bring back some of the equilibrium lost in recent years between business, society and the environment by focusing on a company’s most powerful assets: It’s human resources. Are you ready to have a real conversation? Originally written for and published on CSRwire’s Commentary section Talkback on September 29, 2011. Earlier this year I had the pleasure of joining a variety of leaders in CSR for a roundtable luncheon. Aman Singh chaired the conversation and people from Edelman, Best Buy, Humana, Boeing and Northern Trust discussed some of the CSR issues our companies face today. But this blog is not about the roundtable. It’s about the question Singh asked at the end of our lunch: What advice would I give to aspiring students and professionals who want to work in CSR? I believe students should not focus so much on getting the right job in CSR right away; rather they should focus on getting diverse experiences that will serve them well should they go into business later. It’s these diverse experiences that bring fresh perspective and will help exponentially in defining and driving CSR, sustainability and corporate citizenship in the future. My answer stems from personal experience. After college, I joined the Peace Corps and worked on providing water, sanitation and heath care in Ghana. Then, it didn’t seem like living without electricity, bathing in river water, and building schools and rain catchment systems would lead to much of a career in business. But today as a senior manager for sustainability communications at PepsiCo, I work with partners like water.org and recently attended World Water Week in Stockholm, where PepsiCo launched a report on positive water impact with The Nature Conservancy. I believe coming to a job via a less traveled route, and having learned about important global issues makes one more effective within their company. There are lots of people in politics, media and business who have benefited from the perspectives only a service program can provide. Once you’ve hitchhiked across Africa with 10 bucks in your pocket, starting a business doesn’t seem too intimidating. While I am most familiar with Peace Corps, there are many other service programs like Teach for America and Americorps that provide the same depth of realistic perspective. I am a believer in service, but there are other options too – work for an NGO, travel, teach — just get out there so you can bring something new to the discussion. They say, behind every successful brand, is a PR agency. How about: Behind every responsible brand, is a PR agency? Now, what is the first thought that comes to your mind when you hear that a public relations agency has decided to roll its “CSR experience” into a new division offering clients the opportunity to use their PR capabilities and budget more responsibly, more strategically? You think: CSR is not PR, how many times do we have to say it? Wonder how long this will last. That last statement was the main driver behind Ruder Finn’s new CSR practice, which officially launched two months ago, according to Senior Vice President Sarah Coles. “We had already been doing CSR work with clients like Novartis and Gerber. 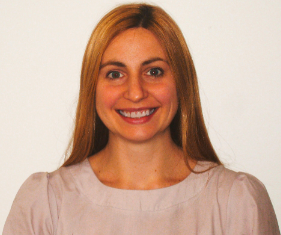 It felt like a natural next step [for the firm],” she says. The communications industry is abuzz with the notion of creating shared value and the professional services sector especially, is in the center of all the activity. Of course, Ruder Finn is not the first PR company to offer CSR strategy and solutions. Edelman has a robust CSR and sustainability solutions practice, as do Burson-Marsteller, Ketchum, Golin Harris, Cone, and many others. In fact, a quick search revealed that CRO Magazine even released a Top 10 list of “Corporate Responsibility PR firms” back in 2008, that placed Ruder Finn at No. 5. But how do you decipher such a ranking? If Ruder Finn was already being lauded for “CSR PR (? )” in 2008, what propelled them to create a new division now three years later? And the big question: What is the differentiator in this burgeoning industry? I turned to Coles who will be leading the new practice and has spent 13 years in PR with the last seven at Ruder Finn, for some answers. The Case For CSR: What were the main motivations behind setting up a new practice focusing on CSR? The Nature of PR: Aren’t most programs reactionary in nature at first contact? Strategizing CSR: What then is the underlining ethos of the new practice? Implementing CSR: How is implementing a CSR strategy going to differ from PR campaigns? Comments? Thoughts? Leave a comment or connect with me @AmanSinghCSR. “I define [it] as how the company does college student become a CSR practitioner? 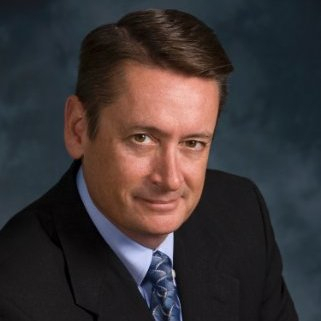 While the essential job search in itself is undoubtedly important, identifying how you define CSR is more important for two reasons: 1) CSR jobs — or jobs with the specific title of CSR/sustainability — are scarce; and 2) The continuing lack of standardized scope and skills attributed with these jobs doesn’t make for a very structured job search. This dual combination then makes it even more crucial that you understand which thread of CSR really interests you, because there are several. While Lublin was referring to social innovation, her comment applies to all of us: We don’t need to reinvent the wheel on responsible and ethical behavior—you just need to have a clear idea of where you stand on it, and how you can apply that to your job search. 1. Define CSR: What does that mean to you — and your career? If you are a great communicator and enjoy writing, then marketing would be a good fit. But if research, analysis and data are your passions, then working on CSR reporting would be a better fit. And if working with people or organizing things is your deal, then HR or even community relations could prove to be better fits. • Certifications: One that instantly comes to mind is the Global Reporting Initiative (GRI) standards, which many more companies — and universities — are starting to adopt. Start building your personal brand. Blog: write about your passion, why you want to work in the field, your motivations, etc. (It might be for free but you’ll get a better-than-decent ROI if you’re seen by the right people.) Write for publications and websites, both mainstream and niche. Meet with like-minded students who are pursuing similar interests. Join your local Net Impact chapter. Arrange informational interviews with the faculty. These conversations will go a long way towards helping you decide whether to pursue what you are passionate or change course: Either way, a huge benefit. Internships: Incredibly important. Pursue as many as possible in your four years at college because that’s the time when you have the least to lose. Internships will give you the hands-on experience that no number of years spent in college can provide. But use these opportunities responsibly because there aren’t many out there. Network, approach each day as a new lap you need to complete, seek out projects, volunteer, focus on demonstrating your skills, and share your opinion. When you do (not if), pick up the pieces and continue on, or start over—both are perfectly okay. Failures later in life will sting a lot more, so fail early and learn well. Another skill that I just cannot overstate the importance of. While you build your personal brand–whether through blogging, research papers, tweeting, commentary on Facebook or the college newspaper—be sure to share it with others. And demand feedback: the good and the bad. Listen to what is being written about the subject, who the prominent speakers are, the movers, the exemplified, the ridiculed (you’ll learn from both, trust me), the practitioners. In the end, use your skills to guide your job search. Once at a company, let your passion guide you in creating the change you want to see happen. We can no longer afford to stand outside and point fingers.